Andrew Sayer from Kensington, Melbourne, Victoria, Australia, publishes a self-explanatory picture. 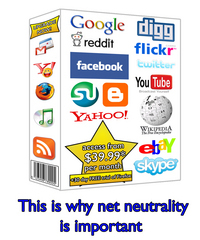 Here's another rendering of what we'll get if we don't have net neutrality. And here's a writeup. Oh, and here's here's what you will look like.